I’ve found that people tend to overlook just how much time they spend in the bathroom; women especially, since we spend even more time in there doing our makeup and washing our faces every night. It makes sense, then, that our bathrooms should look aesthetically pleasing, be clean, and overall, be a welcoming, uncluttered room that we actually enjoy spending time in. These 40 projects and tips will help you achieve exactly that. I now know that the concept of love at first sight is real because I fell head over heels for this mat the second I laid eyes on it. 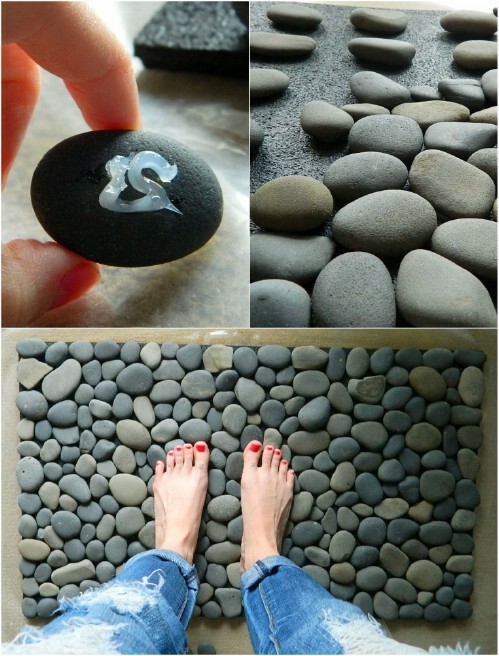 The river stones almost give your feet a mini massage when you step on them. And this specific tutorial is very thorough and ensures that it’s not just pretty, but totally practical too. If you’re bored of the plain white porcelain, you can use this fake, super light stone and glue it on the side of your bathtub for a totally new look. It’ll make your once ordinary tub an extraordinary focal point – this is especially perfect for a smaller bathroom because it draws the eye. 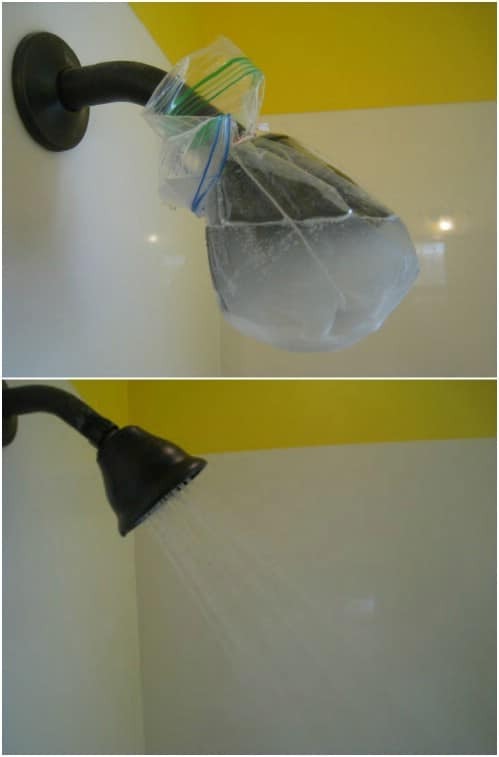 If you want to make sure that your bathroom always smells fresh, you can make your own little air freshener tub. 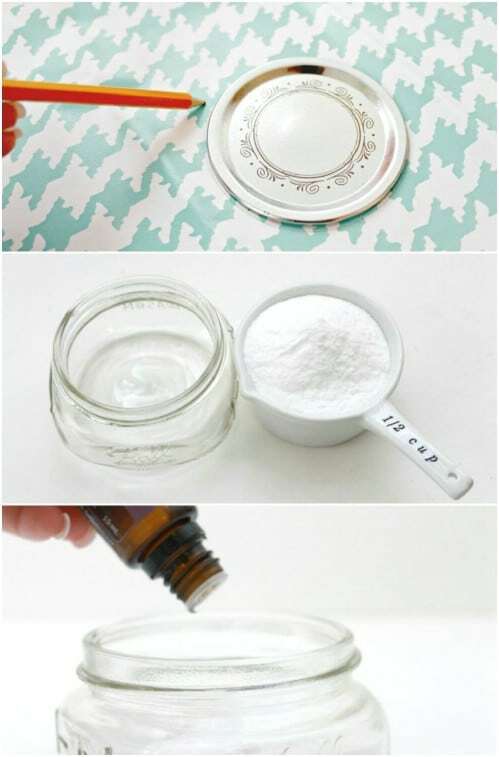 Baking soda will absorb any bad odors, while a few drops of essential oil will emit a subtle scent. 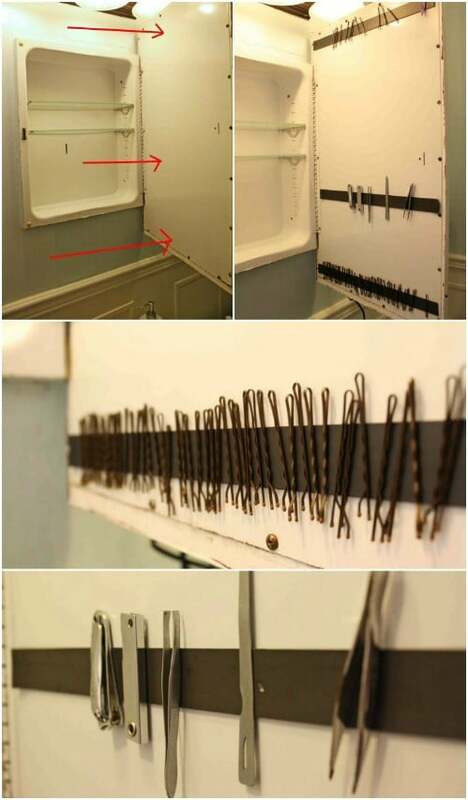 Bobby pins seem to be everywhere and nowhere in my house – sometimes they’re lying all around the place, and other times (when I really need them), they’re impossible to find. Keep yours together with a simple magnetic strip, which is also perfect for metal tweezers and nail clippers. 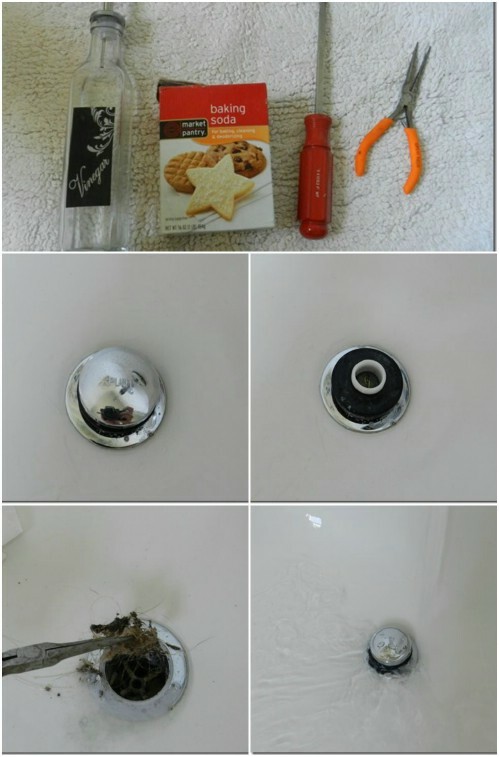 If you have kids, then you may struggle with keeping the sticky toothpaste residue off the sink and who knows where else. It gets pretty gross, and it just looks terrible. 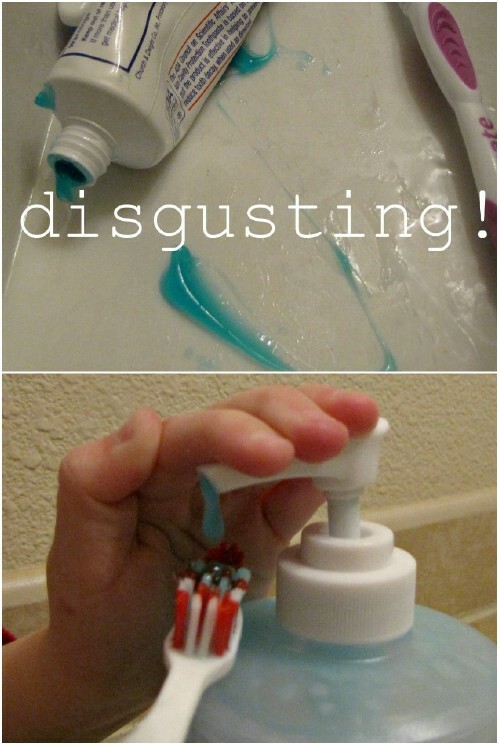 A clever way to combat this is to squeeze your toothpaste into a soap pump bottle! Genius, isn’t it? 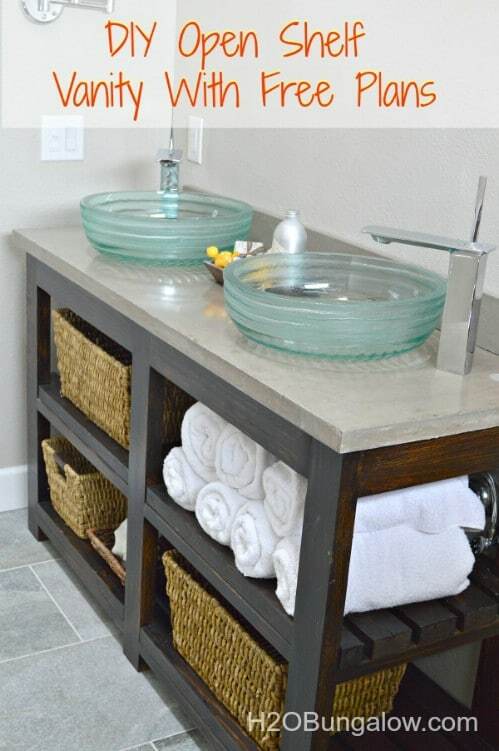 Don’ have enough counter space in your bathroom? 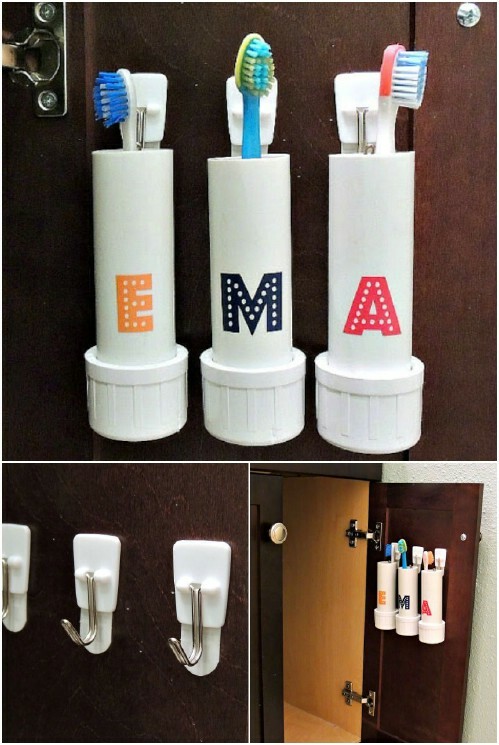 If you don’t like the idea of an ugly cup sitting there to hold your toothbrush, you can really think outside the box and make hanging holders from PVC piping. 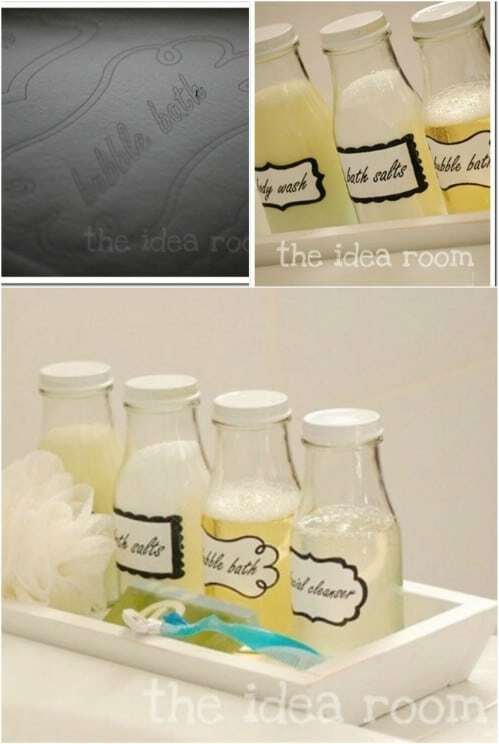 I just love cheap and clever repurposing ideas like these! As you know, I’m all about upcycling and repurposing, so this bath mat made from old towels is right up my alley. 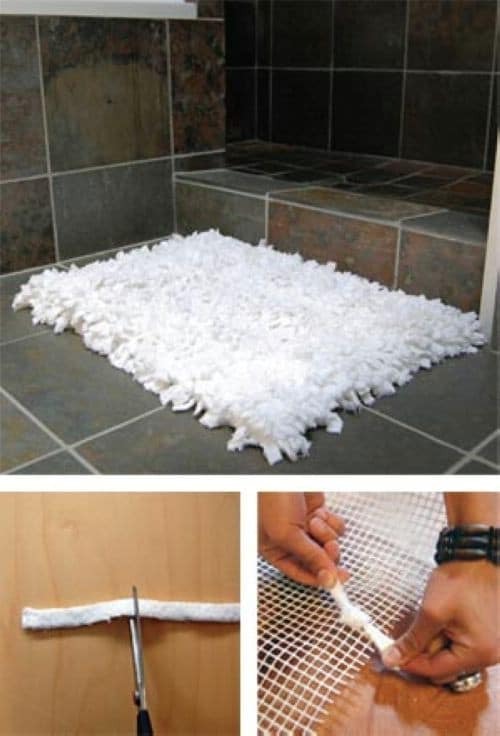 This is a perfect way to reuse your older, scraggly-looking towels and save them from the trash; not only does it look cute in the bathroom, but it really does the job in a luxurious manner. A fun shower curtain can make all the difference if you’re looking to make your bathroom look a little more fun or exciting. 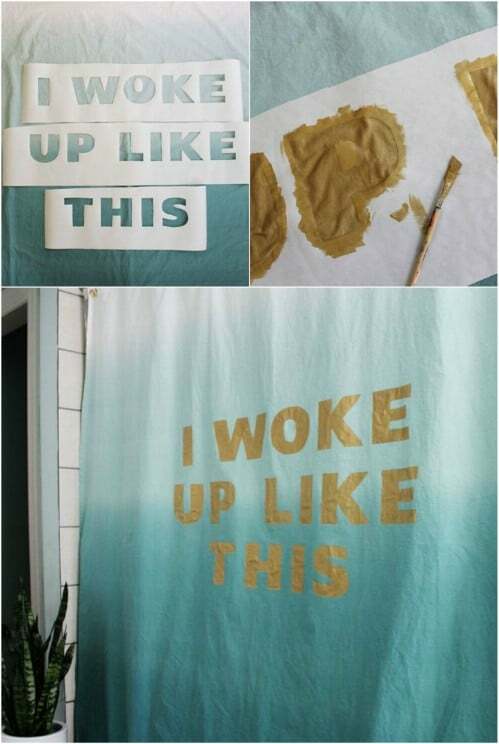 Pick your favorite inspirational or funny phrase and stencil it on to a regular shower curtain. This just gives you that little bit of personalization. If you’re one of those really neat and tidy people with a hint of OCD, then you’ll probably love this one. For those of you who hate the look of ugly and ununiformed bottles cluttering your bathroom area, get a couple of matching bottles that you can label and keep refilling. As you know, I’m all about repurposing, so I really am obsessed with this little gem. This antique window-turned-bathroom cabinet is so rustically elegant, and you’ll be surprised at just how easy it is to find a window like this. It would look especially perfect in a beach house. Although I’m more of a shower person myself, I know there are many of you out there who really look forward to soaking in the tub after a long day. 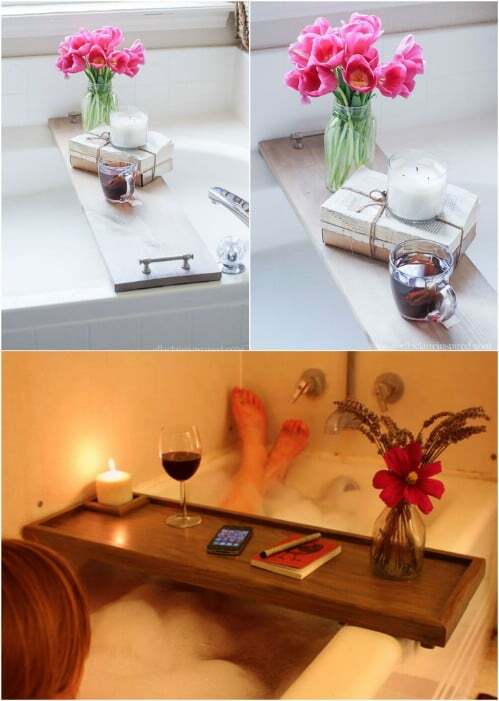 A bathtub tray is the perfect little project for you, then, so that you can rest your cup of tea (and by ‘tea’ I mean ‘wine’, of course), set your scented candle, and keep your book dry and safe. 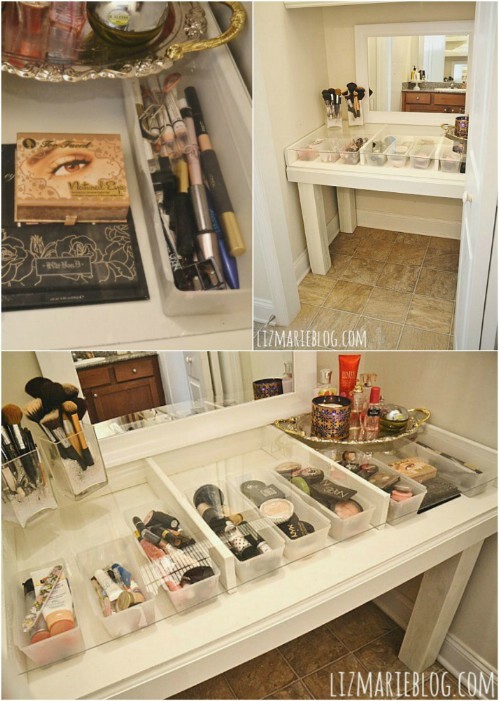 In need of some more space for your cosmetics or other little bits? This wall-mounted cup or jar organizer is absolutely perfect! Not only does it utilize wasted space, but it looks so neat and clean – almost like a piece of minimalist modern art. I keep my cosmetics in a little chest of drawers in my bathroom, but the real issue is that I can’t always see everything I have, and this becomes a serious problem when I find myself in a mad Monday morning rush. This glass top vanity overcomes this issue wonderfully, and, despite all the visible products and tools, it actually looks neat instead of cluttered. If you live in an older house you may be cursed with those unsightly vinyl or linoleum bathroom floors; it’s really not the fun kind of retro, unfortunately. How do you save yourself from the ugliness everyday? Simply paint it! You can go neutral, or turn your bathroom floor into a real statement piece. Have you ever found yourself in a rather embarrassing bind where you notice that your toilet is looking a little dirty and you have people coming over, but no toilet cleaner around and you don’t have time to go buy some? Surprisingly—or maybe not so surprisingly—, Coca-Cola will come to the rescue! Don’t you just hate how your mirrors fog up after a nice hot and steamy shower or bath? Wiping them just makes it even worse! Well this awesome little trick only requires a bar of soap to ensure that you can stare at your beautiful reflection the second you step out the shower. We ladies are all too familiar with hair and products clogging our shower and bath drains; it’s an unfortunate, inescapable fact of life. 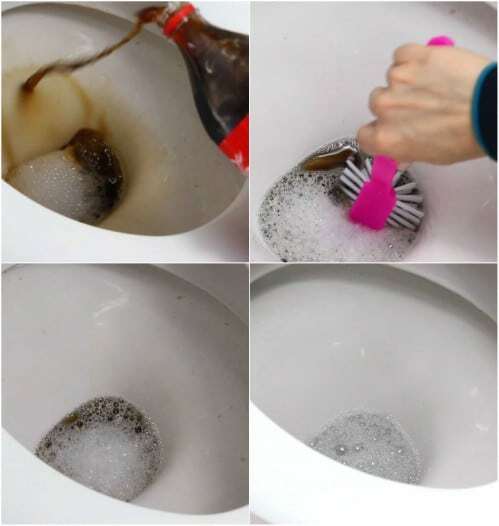 Instead of dishing out on drain cleaner though, you can simply combine two common household ingredients to get that water flowing in no time. I’m not sure when you last inspected your shower head, but I’ll bet that once you do, you’ll feel a little grossed out by all those water deposit marks. Thankfully, this is really easy to clean with everyday household products… and no scrubbing! 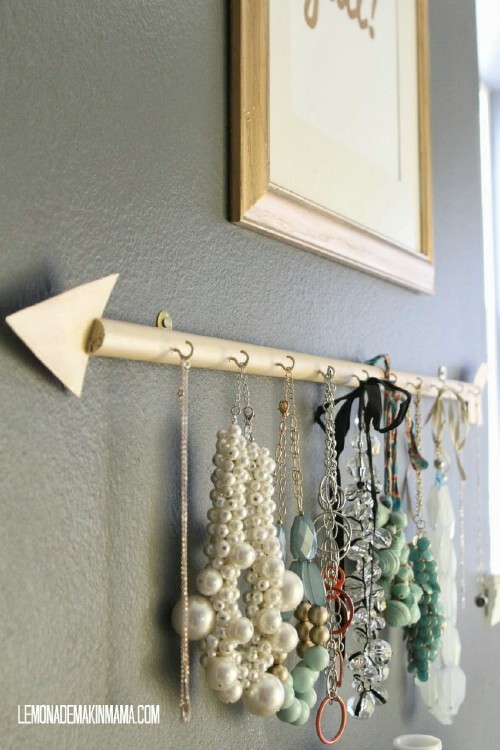 Instead of simply folding or hanging your towels normally, why not make an interesting and pretty wall holder? This brilliant project uses decorated tin cans to house rolled up towels. 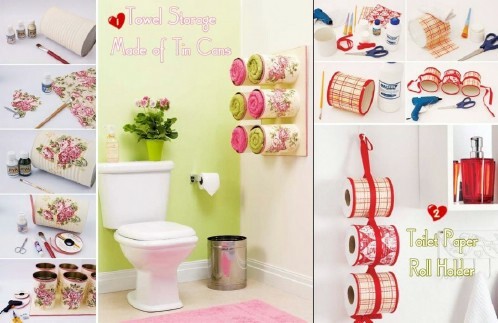 And there’s even a bonus little project to hang your toilet rolls, too. 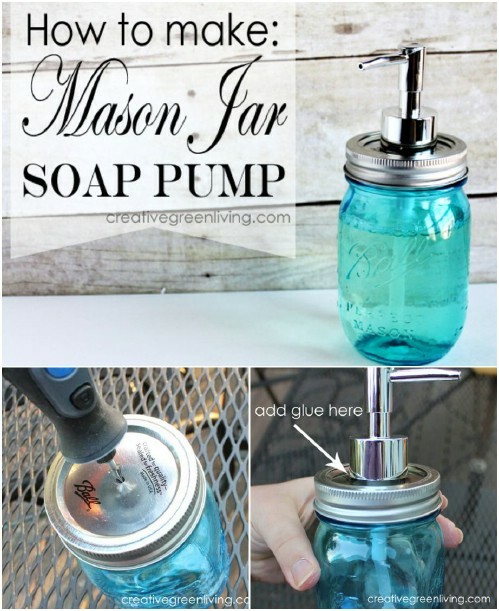 I much prefer liquid soap to a bar of soap sitting by the sink, but if you want to make it look even prettier, ditch the boring plastic bottle and make your own refillable Mason jar soap dispenser. 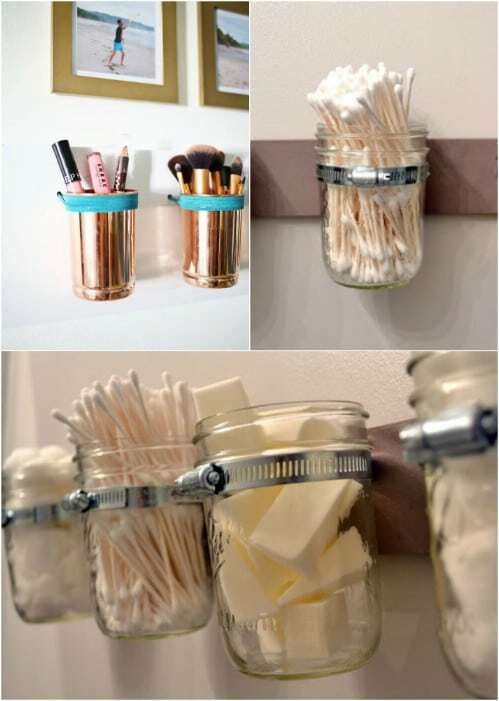 These jars are a DIYers dream, so why not make use of them all over your home? 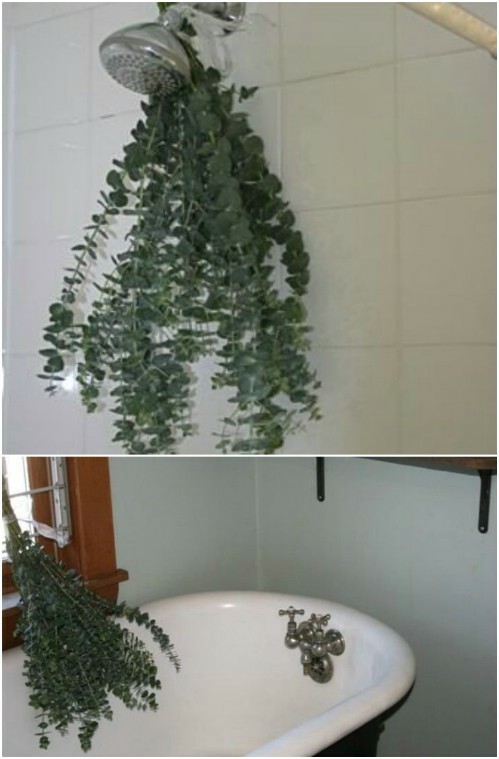 Not everyone loves the signature scent of eucalyptus, but if you do, then a couple of branches can leave your bathroom smelling amazingly fresh and clean. Every time someone has a bath or shower, the steam will circulate the scent – and it’ll keep working long after the branches have dried. 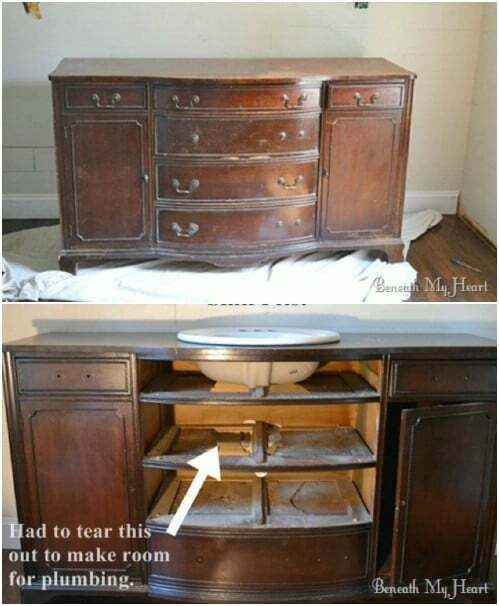 If you want a real showstopper in your bathroom, then why not trawl the thrift stores for an old dresser and turn it into a bathroom vanity? Complete with a sink and proper plumbing, this will certainly be a one-of-a-kind piece. If you don’t like the dresser look and want something a little more modern for your DIY vanity, then here are some plans to build your own open shelf version. Isn’t it gorgeous? I can practically hear those glass sinks calling my name! A pebble stone shower floor is just so spa-like; you almost get a free little foot massage every time that you shower. Thankfully, this is actually relatively simple to do all on your own. And if you have the patience and determination, you could even cover the shower walls, too! If you have a bath and shower combo, then you may need a bit of extra room for your products and other toiletries. 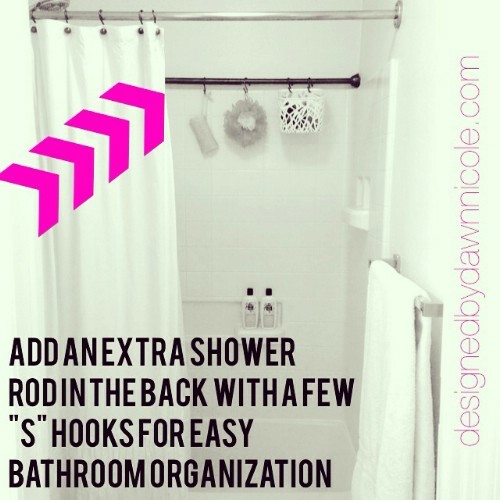 A cheap shower rod on the opposite side gives you all the storage space you need to hang your loofah, shampoo etc. 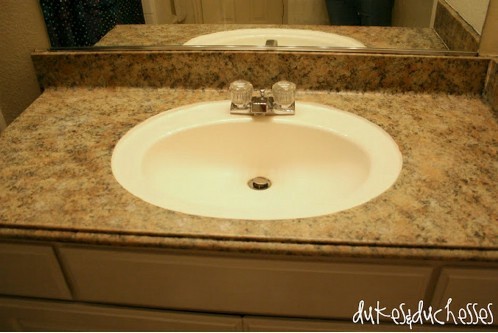 Granite countertops looks stunningly elegant in bathrooms, but the real thing can get rather pricey. If you’re happy to fake it, you can save some bucks with a granite painting kit that gives you the same look for a fraction of the price. Just like granite, marble countertops can be really expensive, so if you’re dying to get the same look without the exorbitant price tag, then here’s how to fake it. This doesn’t come in a kit, though, you’ll have to use some interesting tools to get the look, but as long as you follow the tutorial, you’ll be just fine. The grout in between your tiles in the bathroom, and especially in the shower, can get very dirty very quickly. 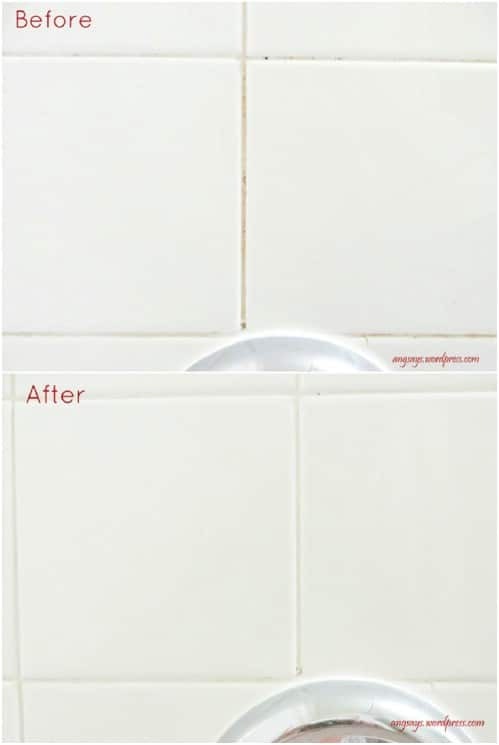 Hydrogen peroxide has any uses in the home, actually, and in this case, when combined with baking soda, it makes the perfect homemade grout cleaner. I’m a little obsessed with this stunning arrow hanger; as soon as I saw it my mind started buzzing with ideas of other areas in the house where this can come in handy. The simplistic and minimalistic handmade piece is just perfect to hang near your vanity and display your lovely jewelry. I love this project because it’s just so different, and the diagramed tutorial is so helpful! 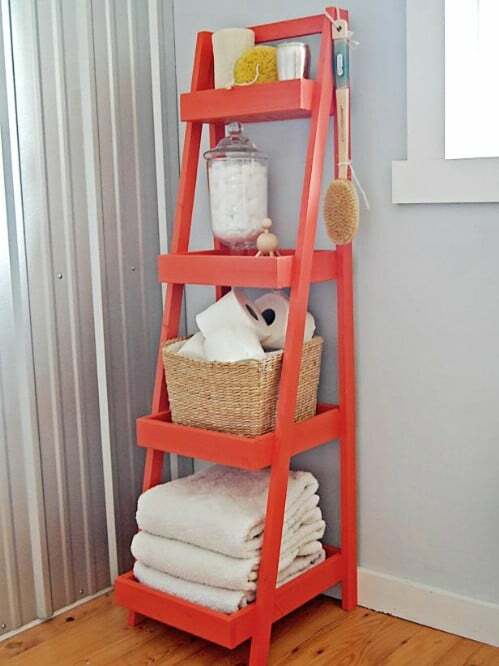 The ladder idea really is so stylish in a bathroom. If you want more of a rustic ladder feel, varnish the wood and sand it down a bit to give it that older, distressed look. 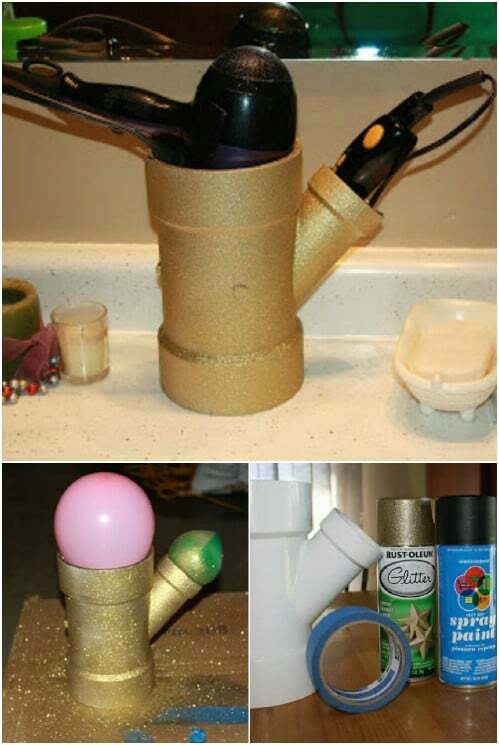 Since I’m on the topic of PVC piping, here’s another clever use for it: a holder for your hairdryer and straightener or curling iron! All you need to do is get the correct part so that you have two compartments, and then just paint the thing to make it look pretty. You can also use PVC parts to make excellent garden tool organizers. 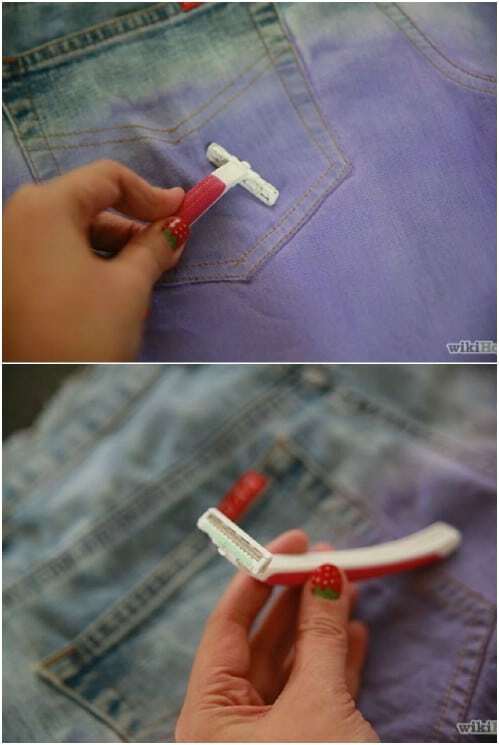 Replacement razor blades can get pretty expensive, so if you want to extend the life of yours and save a bit of cash, all you need is an old pair of jeans for a strop. This method will clean out the blades and actually realign them so that you get a smooth shave without having to dish out the money. A large mirror in a small bathroom can give you the illusion of a bigger room, and framing that borderless mirror makes an even bigger difference in terms of aesthetics. 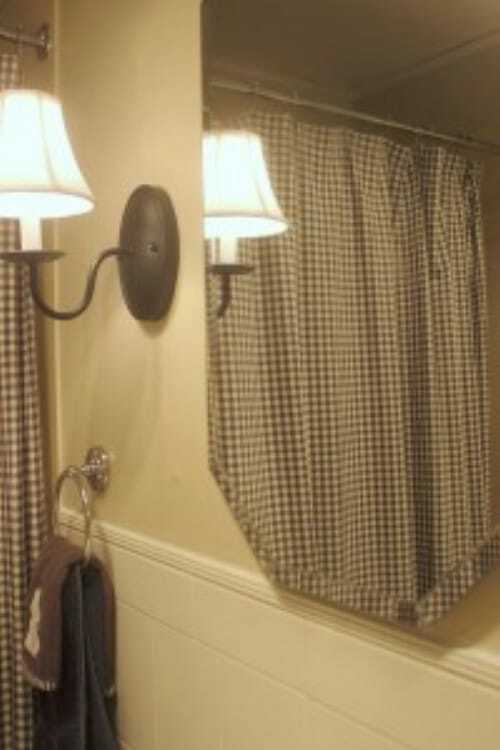 Here’s how to do it if your mirror is already attached to the wall. 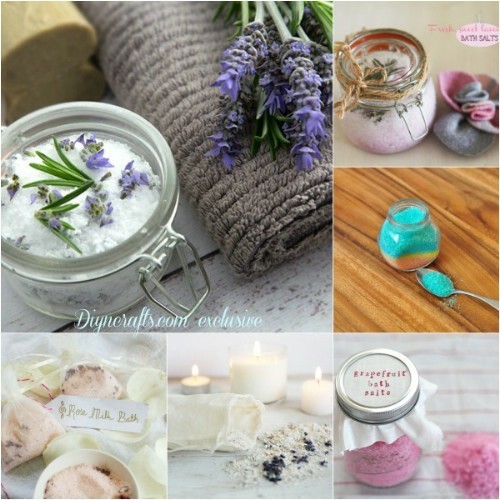 Bath salts don’t just make your bath smell wonderful; depending on the essential oils that you use, tossing your salts in the bath can physically calm you down, help treat flu symptoms, and even relieve pain and emotional stress. Making your own concoctions is so easy! When it comes to painting rooms, the ceiling is often forgotten. A great way to bring back some life to a dull bathroom is to stencil the ceiling and really make it something to stare up at when lying in the bath. For smaller spaces, light colors will open up the room better than dark colors would. Hooded towels look absolutely adorable, but of course, they’re very useful too. 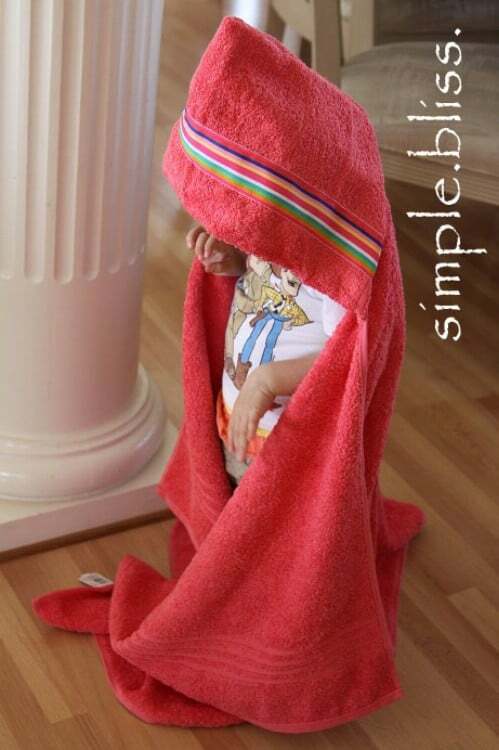 Make your little tots their own hooded towels just by snipping and sewing two towels together; once this easy method is done and dusted you can add a bit of personalization in terms of embellishments. 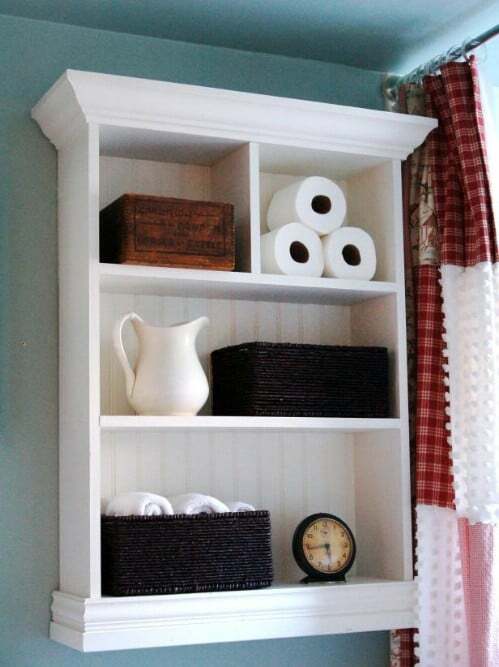 If you just can’t find the perfect cabinet for storage in your bathroom, have you ever considered making your own? This fantastic tutorial will guide you through it step-by-step, and don’t be scared to customize as you go along – you can add more shelves, make them sit closer or further apart… it’s up to you! If you’re working on a beach house, or just love the incorporation of a nautical theme, then why not make these brilliant porthole window shutters? It’s so whimsical and playful (could be great for a kids’ bathroom, too), and you’ll see from the tutorial that it isn’t all that tough to make. If you haven’t been using a sugar scrub to exfoliate then it’s about time you jump on the bandwagon! It’s so easy to make this yourself with just a handful of common household items, and you’ll love the way it makes your skin glow and feel smoother. These also make great gifts, by the way. When I do my makeup in the mornings I like to have some really good light shining down on me so that I have the best view. 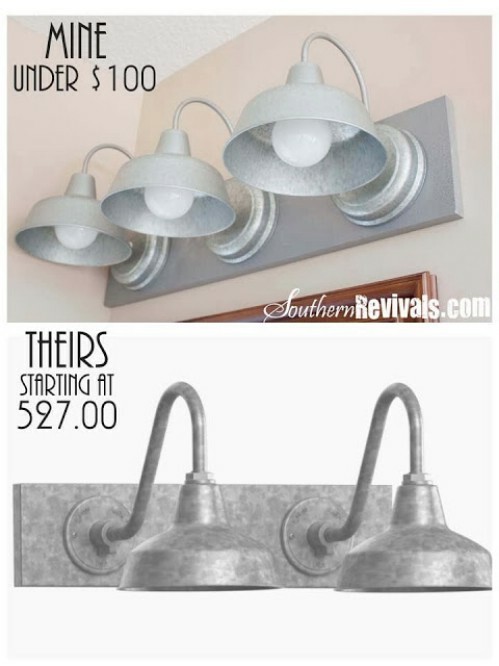 I fell in love with these gooseneck galvanized light fixtures the instant I saw them; and when considering the DIY price compared to the store price, my wallet fell in love too! 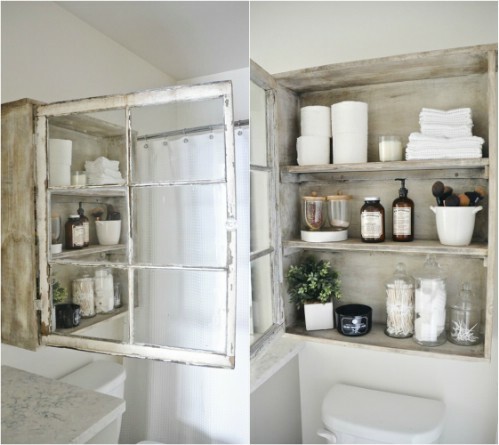 We absolutely love this DIY tile mirror for the bathroom from Centsational Girl. Now, you can have one of these made for you but it will cost a nice little penny to do so. Instead, just do it yourself and you can save that extra money for something special. 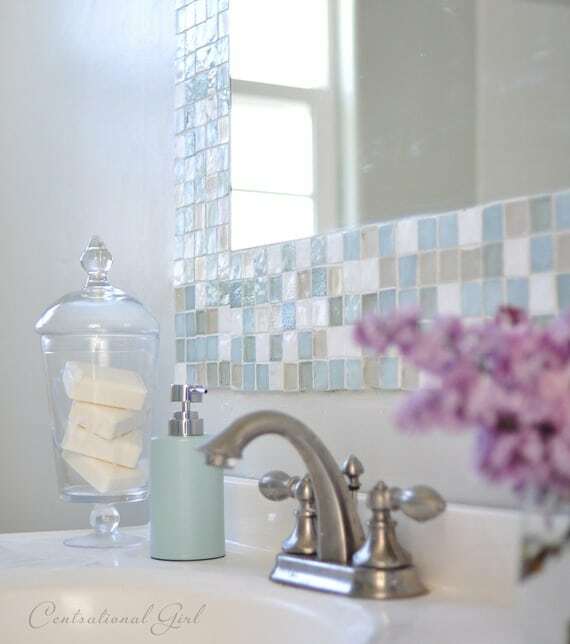 This is a really beautiful tile mirror that you can make in just a weekend. Just buy some small tiles and the supplies needed to install the tiles and then choose a spot on your bathroom wall. In front of the sink looks great and you can match the tiles to whatever you want. 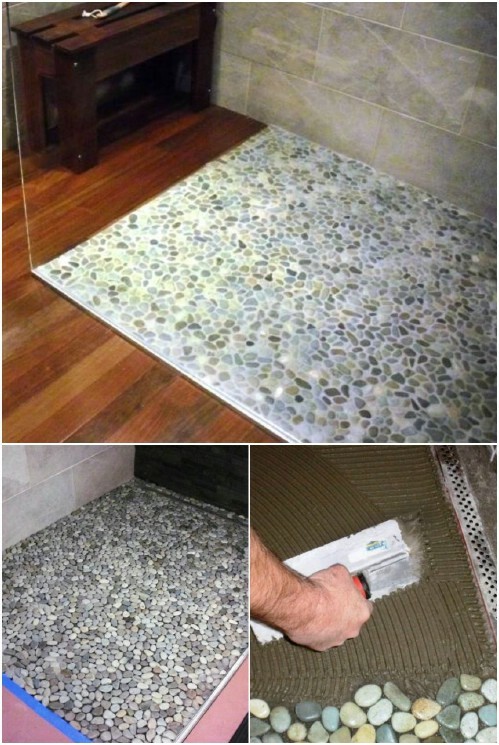 If you really want to be crafty, think about putting in a specific design as you lay the tiles. 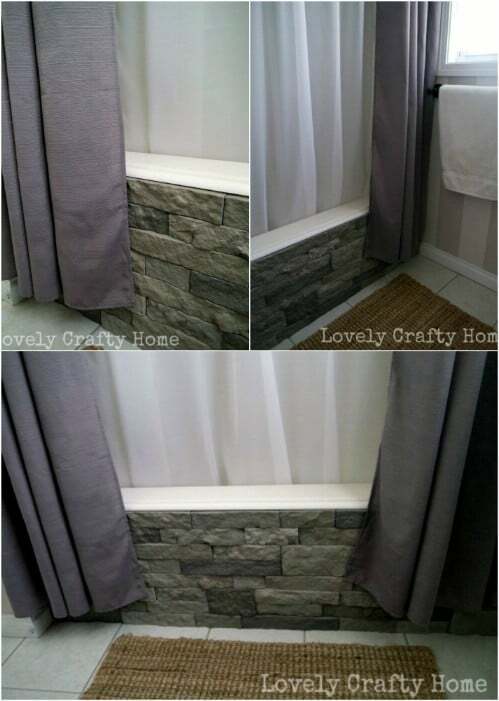 Wow,these looks are simply amazing,I’m inspired especially by the stone mat will be the 1st project I try…..thank you for your time and effort.. I love your ideas. So creative. 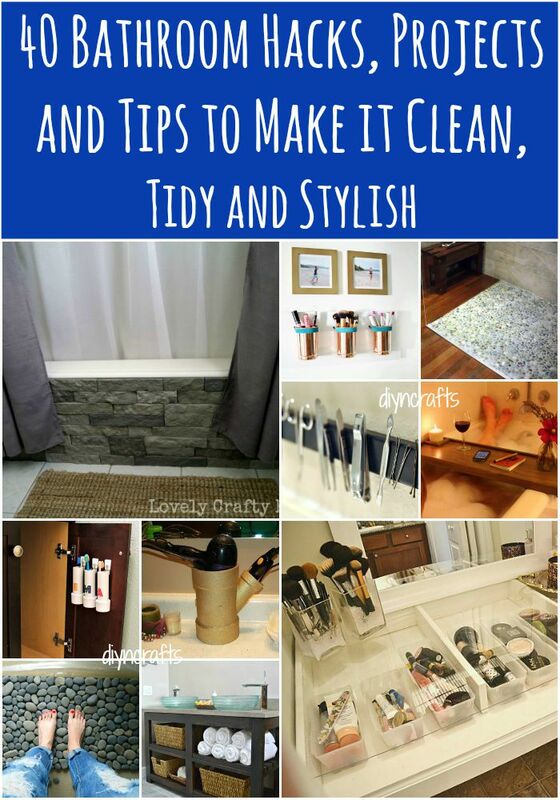 Thanks for your tips about how to improve your bathroom. I never thought about how you could go to a thrift store and turn an old dresser into a bathroom vanity. My only suggestion would be to make sure that you have a plumber install the the sink and provide suggestions on how you might make the cabinet more water proof. Thanks for the great idea.